Former President William Clinton made Rabbi Genack his rabbi. He asserts that although he is a Southern Baptist, "[Rabbi Genack] has been a trusted guide on matters of leadership, justice and faith." Rabbi Genack, a Talmudic scholar, chief executive officer of the Orthodox Union's Kashruth Division and a congregational rabbi, met Clinton when the former President began his campaign for the White House. "As their friendship deepened, the rabbi started sending Clinton brief essays highlighting spiritual insights from the Bible. Later, at Clinton's request, [Rabbi] Genack took a more formal approach, also inviting many distinguished acquaintances to contribute." These include Rabbi Lord Jonathan Sacks, former Chief Rabbi of the United Hebrew Congregations of the Commonwealth; Noa Rothman, Yitzchak Rabin's granddaughter; and noted American rabbis and Jewish scholars. 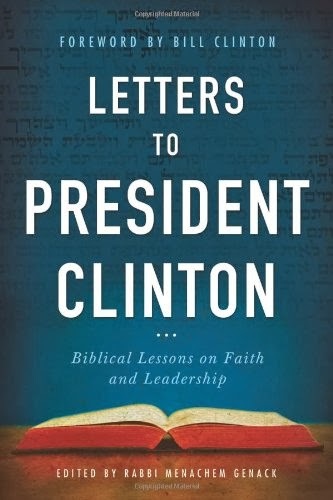 The result is Letters to President Clinton: Biblical Lessons on Faith and Leadership by Menachem Genack and Bill Clinton (Sterling Ethos, 2013). It was a finalist in the Anthologies and Collections category of the 2013 National Jewish Book Awards. Okay, not my favorite book. Maybe it's because I was a Republican, and there is quite a bit of Bush-bashing. There's also plenty of political rigmarole, like "it is ironic that President Clinton is often assaulted by his Republican critics for waffling and changing policy, when his ability to adjust to new circumstances and political reality, while remaining true to his basic vision is the mark of real leadership." Maybe it's because I don't relate to explaining things from a Jewish perspective to a Baptist. There are some bright spots: Rabbi Sacks' letter about "Influence or Power?" was insightful; Jeremy Dauber's discussion of cities was relevant to Clinton's move to New York. But more than that I think of the people involved with the Clintons who suffered mysterious deaths: Vince Foster, Mary Mahoney, James McDougal, Ron Brown, etc. When I read about Queen Esther facing Achashveros, "an innocent girl, ripped from the bosom of her family, unschooled in the art of diplomacy, and unacquainted with the intrigues of a royal court," all I could think of was Monica Lewinsky, the blue dress, and the leader of the free world saying "I did have a relationship with Miss Lewinsky that was not appropriate." 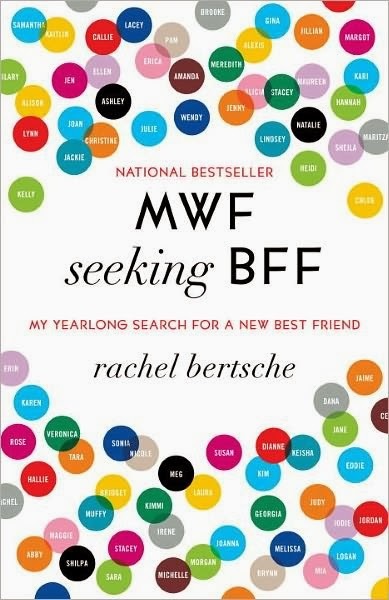 MWF Seeking BFF: My Yearlong Search for a New Best Friend by Rachel Bertsche (Ballantine Books, 2011). I thought this would be a good read for someone moving to a new area, and I was right. The author had 52 "dates" in which she tried to find a good, local friend with whom to get together spontaneously. She did some research by reading books about friendship, and she set herself rules about how she would meet people. Bersche lives in Chicago, so she had her pick of a lot of restaurants, social events, etc. Although not religious, she joined a group for young Jewish leaders. She also took a cooking class and an improv class at Second City. Bertsche even used "friend services" in her research. So what have I done on my friend quest? I've joined a book club, I meet a friend for coffee once a month, and I go to a weekly prayer group. Still on the list: an exercise class, organizing a craft group, and volunteering at the library. I've tried to stay in touch with the people in my Ulpan class, and I am blessed with amazing neighbors who are also very convenient friends. "dan l'chaf zchus" sometimes translates to "give the benefit of the doubt." and Benefit of the Doubt: Breaking the Idol of Certainty by Gregory A. Boyd (Baker Books, 2013), in which this Christian pastor "invites readers to embrace a faith that doesn't strive for certainty, but rather for commitment in the midst of uncertainty. Boyd rejects the idea that a person's faith is as strong as it is certain. In fact, he makes the case that doubt can enhance faith and that seeking certainty is harming many in today's church." But I've also giving the benefit of the doubt to several books that would not normally be on my reading list. The aforementioned book club has chosen A Soldier of the Great War by Mark Helprin. My copy is 860 pages long. It's about an old man walking on the road with a young factory worker. As they walk, the man tells the story of his life. Instead of being off put by the number of pages, the subject matter, or the "My Dinner with Andre"-like, one long conversation about life format, I decided to give the book a chance, and I'm really enjoying it. 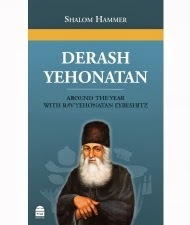 Koren recently published Derash Yehonatan: Around the Year with Rav Yehonatan Eybeshitz by Shalom Hammer. Ravi Yehonatan died in 1764, and Rabbi Hammer has endeavored to "popularize the teachings of Rav Yehonatan and make them accessible to a broader audience." He chose selections that he felt were the most pertinent and poignant. This Rabbi lived in what is now Denmark, had a disagreement with another rabbi that divided the Jewish community and lived in the 1700s. I asked myself if there might be anything in the book that was pertinent and poignant to me. I was pleasantly surprised to find writings about Jewish activism and "the requirement of every Jew to long to be in the Land of Israel." Rabbi Hammer notes that "those who cannot actualize Aliya should at least anticipate the day when they can join Am Yisrael in their land. Those fortunate enough to live in the land should appreciate the opportunity given them." My roommate from my freshman year in college was visiting on her most recent trip of many to Israel. It was great to see her, someone who loves Israel and shows it through frequent visits and support, and to appreciate how far we've both come since our freshman year in college, when making Aliya was a small hope, and I am now fortunate to live in this beautiful country.